Good !! as I see that the way post publish to report with gurus, a little news of the day could do good, as this meeting! The Iraqi capital yesterday received a high-ranking Saudi delegation comprising a number of ministers and officials in order to consolidate bilateral relations between the two countries in the economic, political, security, trade and cultural fields. A Saudi source told Asharq Al-Awsat that "the total number of members of the Saudi delegation is about one hundred." "The high-ranking delegation from the Kingdom is headed by the Saudi Minister of Trade and Investment Majid bin Abdullah Al-Qasabi, which includes a number of ministers, representatives of ministries and senior managers," said Deputy Prime Minister for Energy Affairs and Oil Minister, Thamir Abbas al-Ghadhban. Companies and a number of economic, cultural and security figures. " "Iraq and Saudi Arabia will hold many meetings within the framework of the second session of the Iraqi-Saudi Coordination Council to discuss the enhancement of joint cooperation in all fields to serve the common interests of the two countries economically, politically, commercially, culturally and securityly," Ghadhban said. The Chamber of Commerce and Industry in Riyadh and the Iraqi Chamber of Commerce and Industry in Baghdad yesterday signed a memorandum of understanding to increase trade exchange and investment and economic cooperation aimed at strengthening economic ties between the two countries and harnessing them to serve common interests. The two sides agreed to coordinate visions and positions in regional and international economic forums, conferences and exhibitions, and interest in conducting economic research and studies, to fill gaps in trade and economic laws and international standards. The MoU stipulates that an annual conference of companies, businessmen and women will be held alternately in the two countries, as well as building a database to serve the two chambers, in addition to encouraging exchange and trade of national products between the two countries. The agreement was signed by Riyadh Chamber Chairman Ajlan Al-Ajlan and the Chamber of Commerce of Baghdad, Deputy Chamber President Abdullah Al-Jubouri. Following the signing, Ajlan Al-Ajlan told Asharq Al-Awsat that the memorandum of understanding will enable the two sides to further work on the development of the business and trade sector and economic fields of the two countries. He added that according to official statistics, Saudi Arabia's non-oil exports to Iraq during the past five years reached about 10 billion riyals (2.6 billion dollars). Saudi Arabia's exports to Iraq during the year 2018 amounted to 2.4 billion riyals. The food sector ranked first in Saudi exports to Iraq at 662 million riyals (176.5 million dollars), followed by the construction materials sector with an export value of 565 million riyals ($ 150.6 million). "The presence of a high-ranking Saudi delegation in Baghdad underscores the resolve of the two countries to move forward towards a comprehensive economic, trade and investment partnership," said Iraqi Ambassador to Riyadh Qahtan al-Janabi. Between the two countries in the future of the days. Al-Janabi stressed that the visit aims to move forward to achieve a great deal of comprehensive cooperation and joint action. He pointed out that the two sides are looking forward to creating an atmosphere of cooperation and increasing investments and trade exchange. A visit by a large delegation of 100 members is the first of a Saudi delegation at this level 30 years ago. For his part, Ghadhban said that «the delegation of the Saudi brothers, will meet with the President of the Republic, the Prime Ministers and the Iraqi Council of Representatives, to discuss prospects for strengthening bilateral relations between the two countries». 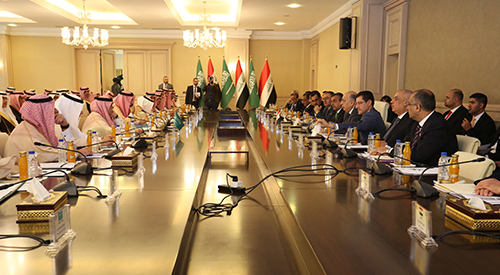 The Saudi-Iraqi Coordination Council held its first meeting in October 2017. It aims at enhancing the bilateral relations between the two countries in all fields to new horizons and coordinating bilateral efforts to serve the interests of the two countries. According to Al-Ghadhban's statement, the Saudi ministerial delegation includes the Minister of Culture Prince Badr bin Abdullah bin Mohammed bin Farhan, the Minister of Environment, Water and Agriculture Abdul Rahman al-Fadhli, the Minister of Energy, Industry and Mineral Resources Khalid al-Faleh, the Minister of Education Hamad Al- Minister of Information Tariq al-Shabbaneh and Minister of State for Arab Gulf Affairs Thamer al-Subhan. The delegation also includes the Governor of the General Customs Authority Ahmad Al-Haqbani, the Deputy Minister of Energy, Industry and Mineral Resources Abdul Aziz Al-Abdul Karim, the Chairman of the Public Transport Authority Rumih Al-Rumaih, the Governor of the General Authority for Foreign Trade Abdul Rahman Al-Harbi and representatives of the Ministry of Interior, the Ministry of Foreign Affairs, the Ministry of Finance, Energy, Industry and Mineral Resources, Ministry of Transport, Ministry of Information, Ministry of Commerce and Investment, Ministry of Education, Ministry of Environment, Water and Agriculture, Ministry of Islamic Affairs, General Investment Authority, Saudi Arabian Monetary Agency Intelligence, and the Saudi Export Development, the General Civil Aviation Authority, and the public transport, the General Ports Authority, the General Authority for Sport, and the Saudi Organization for Industrial Cities and Technology Zones, the Saudi Fund for Development, and the head of state security, and the King Salman Relief. The delegation also includes representatives of major Saudi companies wishing to invest in Iraq in various sectors. "Saudi Arabia is sending a strong message to Iraq by sending a large and high-level delegation," said Munaf al-Moussawi, director of the Baghdad Center for Strategic Studies and International Relations. "I think it's a very good message for Iraq and the region." "The government and the Iraqi cabinet have taken a courageous and important decision to protect Saudi investment in Iraq, which will certainly lead to the completion of Saudi investment mechanisms in Iraq," Moussawi said in an interview with Asharq Al-Awsat. Moussawi said that "Iraqi-Saudi relations enter a new and unprecedented phase of understanding and harmony, which will result in building balanced relations at all levels that serve the vital and common interests between the two brotherly countries." "The Saudi political, economic and cultural delegation that is visiting Iraq today is an unprecedented delegation from the Kingdom, even from the rest of the Arab and regional countries," said Wathiq al-Hashemi, head of the Iraqi Group for Strategic Studies. , And this is a clear indication of the interest of the Kingdom of Iraq and the growing relationship between the two countries ». 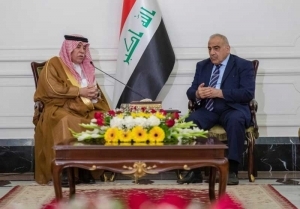 Al-Hashemi pointed out that "the Saudi and regional openness to Iraq is in the interest of the region, and Iraq can now be an active player in the game of balance in regional and international relations." He said that «the politicians in Iraq to invest this moment of openness, to serve the interests of the country, and stop the role of the distribution of loyalties of one party or another, for the rise of the country». Prime Minister Adel Abdul-Mahdi revealed yesterday the visit of the Saudi delegation and announced his intention to visit the Kingdom during the next two weeks. He said that the delegation and the upcoming visit aim to "discuss all matters related to developing relations with the Kingdom and are keen to develop them. , And we are happy, because it is in the interest of Iraq ». Iraqi-Saudi relations have been steadily growing since the kingdom reopened its embassy in Baghdad in December 2015 after a 25-year break. In February 2017, former Saudi Foreign Minister Adel al-Jubeir visited Baghdad, the first visit by a Saudi foreign minister to Iraq in 27 years. The Iraqi Council of Ministers decided at a meeting yesterday, the Convention for the promotion and protection of investment between the Republic of Iraq and the Government of the Kingdom of Saudi Arabia. Which observers considered would open a wide door to Saudi investments in Iraq. Iraqi Prime Minister Adel Abdul Mahdi received on Wednesday the Saudi economic delegation in the Iraqi capital Baghdad, according to the Iraqi News Agency "conscious ". A high-ranking Saudi economic delegation comprising seven ministers began an official two-day visit to the Republic of Iraq on the sidelines of the second session of the Iraqi-Saudi Coordination Council . The Saudi delegation, headed by the Minister of Trade and Investment, includes Majid bin Abdullah Al Qasabi, Prince Badr bin Abdullah bin Mohammed Farhan, Minister of Culture, Ministers of Environment, Water and Agriculture, Abdulrahman Al Fadhli, Energy, Industry and Mineral Resources, Khalid Al Faleh, , Turki Al Shabbana, and the State for Gulf Affairs, Thamer Al-Sobhan . Saudi Arabia's consulate in Baghdad will be opened to grant visas to Iraqis on Thursday, the Saudi minister of trade and investment said . The Saudi news channel reported that Majid al-Kasabi, during his visit to the head of an official delegation to Baghdad, revealed a $ 1 billion grant to Iraq . According to the Saudi Press Agency, al-Kasabi said that Saudi Arabia has provided a grant to Iraq in the amount of one billion dollars to contribute to its development to be a key partner in the renaissance of Iraq. Al-Qasabi announced the opening of the Saudi consulate in Baghdad on Thursday, with the opening of three consulates soon in a number of Iraqi provinces. The Saudi minister said in a press statement after his arrival in the Iraqi capital Baghdad, that Arar port border between the Kingdom and Iraq will be completed after six months from now, as work goes ahead to build the sports city in Baghdad after the allocation of land for construction. He pointed out that there are a number of economic agreements ready to be signed between the two countries. [ltr]Saudi Arabia will open its consulate in Baghdad to grant visas to Iraqis, the Saudi minister of trade and investment said on Wednesday. "Three more consulates will be opened in Iraq," said al-Kasabi, who heads his country's delegation on the eve of the Iraqi-Saudi coordination council meeting in Baghdad. Reuters) - Oil Minister Thamer al-Ghadhban announced on Wednesday a Saudi desire to invest in Iraq. 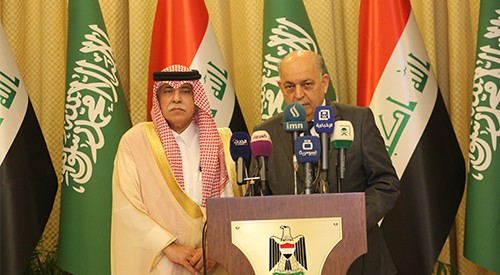 "There is a Saudi desire to invest in Iraq," said Ghadhban, who is the head of the Iraqi delegation in the Iraqi-Saudi Coordination Council, in a joint news conference with the Saudi minister of trade held in Baghdad and attended by the Mawazin News. "The Saudi- Shared Files Day Tomorrow. " For his part, Saudi Trade Minister Majid al-Kasabi said that "the Saudi delegation includes 115 people, which represents the seriousness of Saudi Arabia in building bridges of communication and promote commercial investment with Iraq." He added that "13 agreements will be signed by Iraq and Saudi Arabia during the visit of Adel Abdul Mahdi, the coming to Saudi Arabia." arrived Aash Baghdad on Wednesday, a high - level Saudi delegation comprising six ministers headed by Saudi Minister of Trade and Investment Majid bin Abdullah cane. The delegation, which is on a two-day visit, will participate in the work of the second session of the Saudi-Iraqi Coordination Council. And includes the largest Saudi companies wishing to invest in Iraq, in various sectors. He stressed that the first work will be the development of the border crossing Arar, which links Iraq by land to Saudi Arabia, to facilitate the passage of pilgrims, noting that the development of the crossing will return large financial resources to the Iraqi side. During the next two weeks, Prime Minister Adel Abdul Mahdi will go to Saudi Arabia to discuss "important issues." With regard to the Saudi side, Al-Amin said that the latter is interested in developing the infrastructure of the liberated cities and there is investment for the re-operation of factories in Iraq and the revitalization of the industrial sector as well as the private sector, which would provide many jobs. He stressed that the economic expert that Iraq in the previous period succeeded in managing its international relations and was able to emerge from the «regional isolation» and thus ended many of «economic setbacks», expected that Iraq will reap the fruits of this regional opening during the next two years. The newspaper "Economy News" continued with the Information Office of the Ministry of Finance, who confirmed that he did not have any information regarding the visit of the Saudi delegation to Iraq. And that he will publish it to the media once the necessary information has been completed. Also got "the economy News" and the minute includes the topics to be discussed by the delegations of Iraq and Saudi Arabia on the sidelines of the meeting of the Coordination Council between the two countries. As it will be «an offer of what has been accomplished and agreed upon in the subcommittees (the seven committees) as well as discuss the proposal to form a joint business council between the two countries». The document confirms that the two sides will discuss "the subject of the stadium dedicated to the Saudi king to Iraq, as well as the agreement to determine priorities for the next phase 20192020 and to develop plans to implement these priorities." The delegation will hold several meetings on its first day, including a meeting between the Saudi private sector and its Iraqi counterpart, as well as its meeting with President Barham Salih. The Iraqi Oil Minister, Thamer Ghadhban, revealed the existence of a Saudi desire to invest in Iraq. "There is a Saudi desire to invest in Iraq," said Ghadhban, who is the head of the Iraqi delegation in the Iraqi-Saudi Coordination Council, in a news conference attended by "Economy News". "The Iraqi-Saudi Coordination Council will discuss the joint files tomorrow." "Iraq wants to open up to Saudi Arabia and develop its trade and economic relations," he said. On the other hand, Saudi Trade Minister Majid al-Kasabi said that the Saudi delegation includes 115 people, which represents the seriousness of Saudi Arabia in building bridges of communication and promoting commercial investment with Iraq. He explained that 13 agreements will be signed by Iraq and Saudi Arabia during the visit of Adel Abdul Mahdi, the coming to Saudi Arabia, pointing out that the port of Arar will be completed re-eligibility during the next six months. He stressed that Saudi Arabia has allocated $ 1 billion to build development projects inside Iraq, indicating that Iraq told us to allocate land for the city of sports. The Saudi minister of trade and investment, Majid al-Kasabi, said that the Iraqi side offered the Saudi side 186 investment opportunities. "The Iraqi delegation offered the Saudi delegation 186 investment opportunities in various fields," Al-Qasabi said in a joint press conference with the Prime Minister for Energy and the Chairman of the Iraqi Coordination Committee - Thamir Abbas Ghadhban in the hospitality palace in the Green Zone. He stressed that the Saudi side will study these offers well and will choose the best ones, revealing at the same time the idea of ​​establishing a free zone on the border port between the two countries. He added that "Saudi Arabia provided ideas, whether represented by Aramco or SABIC or the Saudi Metals Company, for some opportunities that can be invested in Iraq, in addition to the idea presented to the private sector to establish a free zone on the border post, which was welcomed by the two sides will be studied and the mechanism of implementation to be announced." Saudi Arabia is preparing to open its consulate in Baghdad on Thursday, the Saudi minister of trade and investment, Majid al-Kasabi, said. "The Saudi consulate will be opened in Baghdad tomorrow (Thursday) to give visas to Iraqi travelers from Baghdad without going to Jordan," al-Gosaibi told a news conference in Baghdad on Wednesday. He added: "We will work to open three consulates in different provinces in the country," stressing the keenness of Saudi Arabia to "build bridges of communication to promote trade exchange between the two countries." Al-Qasabi noted that "Arar port between Saudi Arabia and Iraq will be completed within the Iraqi and Saudi side within six months." A senior Saudi delegation arrived in Baghdad on Wednesday afternoon and Prime Minister Adel Abdul Mahdi will travel to Saudi Arabia within two weeks. 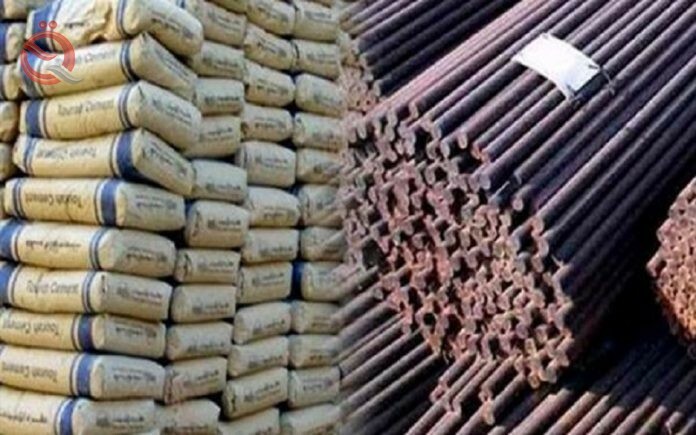 Riyadh - The Board of Directors of Riyadh Chamber of Commerce Ajlan Al-Ajlan revealed on Thursday the importation of building and food materials worth more than 326 million dollars during the last year 2018. "Saudi Arabia's exports to Iraq during the year 2018 amounted to 2.4 billion riyals, and the food sector ranked first in Saudi exports to Iraq at a value of 662 million riyals," Al-Ajlan said in an interview with the Saudi daily Asharq Al-Awsat. (176.5 million dollars), followed by the construction materials sector with an export value of 565 million rials (150.6 million dollars). He added that "according to official statistics, Saudi Arabia's non-oil exports to Iraq during the past five years, to about 10 billion riyals ($ 2.6 billion)." Saudi Arabia has pledged a $ 1 billion grant to build a sports city in Baghdad at the start of a two-day visit by senior Iraqi officials aimed at boosting ties between the two countries. "King Salman will give a $ 1 billion grant to Iraq to build a sports city," Saudi television said. For his part, said the Saudi Minister of Investment Majid bin Abdullah al-Kasabi, "There are 13 agreements ready to sign and work at the border crossing Arar border linking Iraq to Saudi Arabia will be completed within six months." A Saudi economic delegation comprising the energy and investment ministers arrived in Iraq on Wednesday to attend the second meeting of the Saudi-Iraqi Coordination Council, an initiative launched in 2017 to develop relations between the two neighboring countries. Deputy Prime Minister for Energy Affairs and Oil Minister and Chairman of the Iraqi Coordination Committee - Saudi Thamer Ghadhban, Thursday, that the location of the stadium, "Mahdy" from Saudi Arabia to Iraq will be in the area of ​​Basmaya. Al-Ghadhban said during a joint press conference with the Saudi Minister of Investment Majid bin Abdullah al-Qasabi held at the hospitality palace in the Green Zone in Baghdad. He continued, "The Economy News," that "the sports stadium dedicated by Saudi Arabia will be the nucleus of a sports city," noting that " Near Baghdad. " "Saudi Arabia has allocated 1.5 billion dollars in grants to Iraq," Saudi Arabia's investment minister said. "One billion dollars will be allocated to build the sports stadium in Iraq, while 500 million dollars will be allocated to export subsidies." In a telephone conversation with former Prime Minister Haider al-Abbadi on June 25, 2018, Saudi King Salman bin Abdul Aziz gave a sports stadium to Iraq as the nucleus of a sports city. Riyadh - Saudi Arabia seeks to support development efforts in Iraq and to build bridges with Baghdad for political, economic and cultural ties between the two countries. In compliance with Saudi commitments to Iraq, King Salman bin Abdul Aziz announced that he would provide a $ 1 billion grant to Baghdad to build a sports city. The announcement coincided with the start of a two-day visit by a high-level Saudi delegation to Saudi Arabia aimed at strengthening ties between the two countries. The Saudi delegation includes more than 100 high-ranking officials, including ministers, deputy ministers and businessmen, to attend the second meeting of the Saudi-Iraqi Coordination Council, an initiative launched in 2017 to develop relations between the two countries. Saudi Arabia's investment minister, Majid bin Abdullah al-Kasabi, said the kingdom had opened its consulate in Baghdad to begin issuing visas to Iraqis and three consulates would be reopened in Iraq. Saudi Arabia reopened its embassy in Baghdad in 2015 after a 25-year break. Al-Qasabi added that 13 agreements are ready to be signed, and that work at the Arar border crossing point linking Iraq to Saudi Arabia will be completed within six months. Thamer al-Ghadhban, Deputy Prime Minister for Energy and Iraqi Oil Minister, expressed his country's happiness in this visit, which comes within the framework of strengthening bilateral relations which are witnessing steady growth. The program of the visit includes several meetings and meetings to discuss memorandums of understanding at the levels of economy, trade, transport, culture, pilgrimage and others. "There will be serious meetings to strengthen relations between the two countries, as well as important steps to enhance investment opportunities with brothers, in order to build and support bilateral cooperation, especially between the private sector of Iraq and Saudi Arabia," Ghadhban said. The Kingdom of Saudi Arabia is striving to return Iraq to its Arab cradle from the gate of supporting the country's development and reconstruction, in order to close all the gates to the Iranian plans to further subject Baghdad to the authority of Tehran and the threat to the stability of the region as a whole. Riyadh felt a great desire from Baghdad to return relations with Arab countries to the past. The economic expert Basil al-Obeidi, on Thursday, the opening of Iraq towards the Gulf region, "an important step" in the right direction, pointing out that the visit of the Saudi economic delegation to Iraq will open the doors of a huge investment will eliminate the unemployment of young people. "The opening of Iraq to the Arab and Gulf region is a very important step to correct the course of economic relations," al-Obeidi told the news agency. "The visit of the Saudi economic delegation to Iraq will open the door to a huge investment that will eliminate youth unemployment and create great opportunities in Iraq," he said. He said Obeidi that "Iraq has huge investment opportunities in several areas, most notably tourist areas and housing projects and the reconstruction of infrastructure and any company that goes to Iraq will win a lot of investment." The Iraqi Minister of Planning Nuri Sabah al-Dulaimi said on Thursday that Iraq adopts the policy of opening up regionally and internationally in all fields . Dulaimi said in a statement to the ministry, quoted by the Iraqi News Agency (INA), that Iraq seeks to strengthen relations with the Kingdom of Saudi Arabia and invest in all sectors . He added: "There will be extensive meetings between Iraqi and Saudi businessmen to share experiences, ideas and projects, after the issuance of visas from the Saudi consulate in Baghdad after the opening ." The minister stressed the joint endeavor with neighboring countries towards the activation of border crossings, expected to reopen the port of Arar border during the second half of this year after the completion of rehabilitation . He said that the Ministry of Planning will participate in the management of all Saudi grants, with the World Bank, for optimal guidance for investment . RIYADH: Saudi Arabia's consulate in Baghdad will be opened on Thursday, the Saudi minister for trade and investment said . 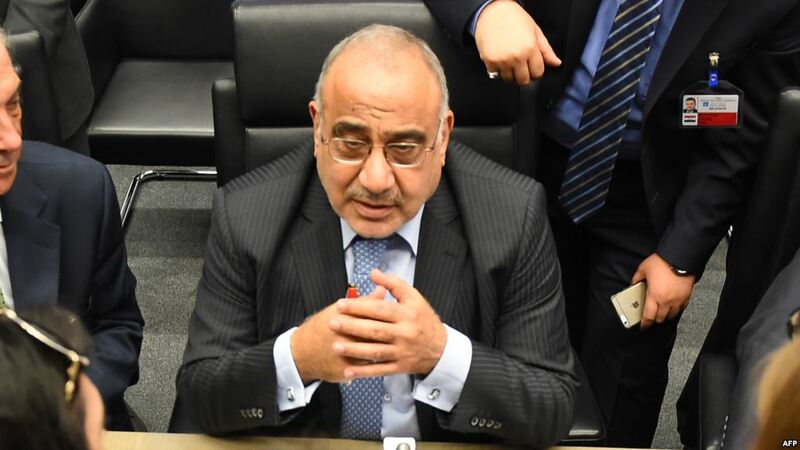 During a press conference with Iraqi Prime Minister, Deputy Prime Minister for Energy Affairs and Minister of Oil Thamir al-Ghadhban, al-Qasabi said he is working on opening three consulates in three Iraqi cities soon, according to the Saudi Press Agency SPA . He pointed out that there are 13 agreements and memorandums of understanding between the Saudi and Iraqi sides in all fields are in their final stages and will have a significant impact in raising the level of cooperation between the two countries . Al-Qasabi pointed out that the new outlet Arar will be opened after 6 months from now, stressing that it will be a major step in the way of strengthening trade relations and raising the level of trade exchange between the two countries . Al-Qasabi stressed the keenness of the Saudi government to support development projects in Iraq, including the allocation by the Kingdom last year of a loan of one billion dollars to support these projects for the benefit of the two peoples . He added, besides 500 million dollars to enable the exports announced by the Minister of State for Foreign Affairs Adel Al-Jubeir last year in Kuwait, including: King Salman Bin Abdulaziz Sports City project presented by the Saudi monarch to the Iraqi people . 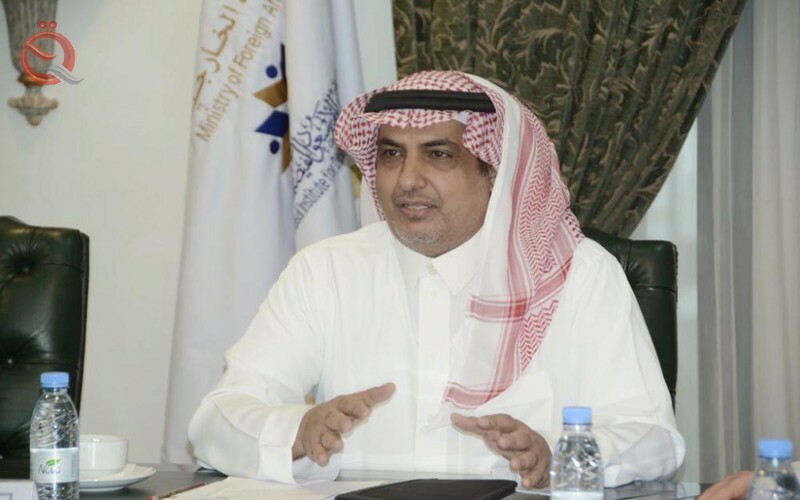 The minister revealed that Saudi Arabia will provide annual educational grants to Iraqis to study in the universities of the Kingdom . The Saudi-Iraqi Coordinating Council aims to enhance communication between the two countries at the strategic level and to promote bilateral relations to new horizons in various fields, including economic, development, security, investment, tourism, cultural and media . To promote joint cooperation between the two sides in important international and regional affairs, to safeguard common interests and to develop partnership between the private sector in both countries . The Council aims to provide businessmen with the opportunity to learn about trade and investment opportunities, adopt effective means to help them invest in them, and encourage the exchange of technical and technical expertise among the concerned parties . Foreign Minister Mohammed Ali al-Hakim attended the opening ceremony of the consulate of Saudi Arabia in Baghdad. The Ministry said in a statement: "This comes as a practical indicator to strengthen communication between Baghdad and Riyadh, and the keenness of the two brotherly countries to facilitate consular services and provide facilities to those wishing to visit the Holy Land in the Kingdom; to perform Hajj, Umrah, Procedures of labor movement and trade exchange between the two countries. " 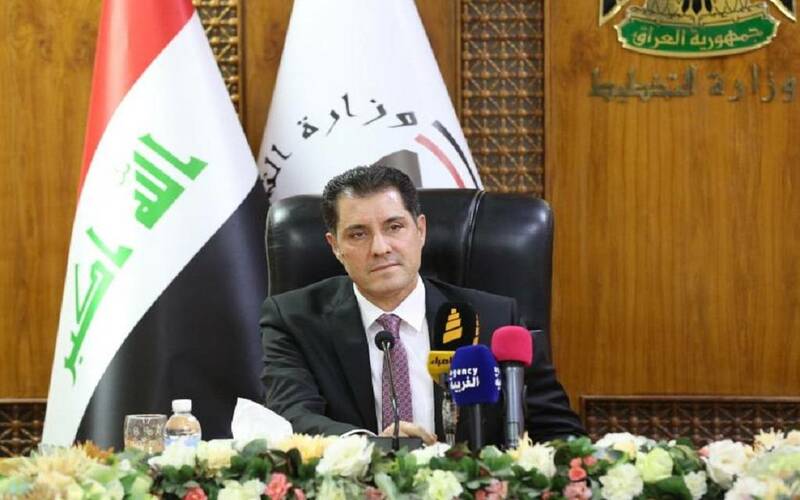 BAGHDAD / The Minister of Planning Nuri Sabah al-Dulaimi said on Thursday, April 4, 2019, that Iraq adopts the policy of opening up regionally and internationally in all fields, pointing out the existence of 8 different committees that emerged from the joint council to raise the level of this cooperation. "Iraq is adopting a policy of opening up regionally and internationally in all fields," said the Information Office of the Ministry of Planning in a statement to the obelisk. He said that during the presiding of the Economic, Investment, Trade, Development and Relief Committee, Dulaimi met with a high-ranking Saudi delegation. Iraqi Saudi in its second session held in Baghdad. " Dulaimi said there was "the possibility of reopening the port of Arar border during the second half of this year after the completion of rehabilitation," noting the existence of "a joint effort with neighboring countries towards the activation of border crossings." Al-Dulaimi said that "close meetings are held between Iraqi and Saudi businessmen to exchange experiences, ideas and projects, especially after the issuance of visas from the Saudi consulate after opening in Baghdad." Al-Dulaimi stressed that "Iraq is seeking to strengthen the joint relations with Saudi Arabia and invest in all sectors in which the kingdom has advanced experiences and previous experiences." He pointed out that "all grants and loans will participate the Ministry of Planning in its management with the World Bank and the best guidance for investment." 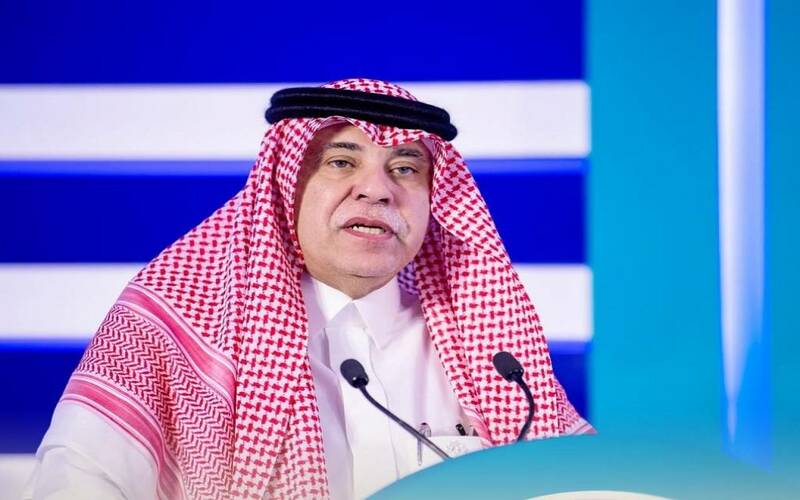 The Saudi Minister of Trade and Investment Majid al-Kasabi revealed on Thursday the readiness of four giant Saudi companies, representing the Saudi economy, to enter the Iraqi market strongly. "The four companies, Aramco, which is involved in the investment in a gas aggregation project, SABIC to invest in the construction of the petrochemical complex, and Ma'aden, to invest in phosphates, fertilizers and aluminum," Al-Gosaibi said. Aquapaz, to invest in a project to connect electricity and renewable energy projects. " The newspaper said, quoting Al-Gosaibi, that "these companies will enter into any investment project within its field, determined by the Iraqi side." said three sources familiar with Saudi Arabia 's policy in the field of energy, the kingdom threatened to sell oil in currencies other than the dollar if Washington passed a law that makes members of the Organization of Petroleum Exporting countries are prone to lawsuits for antitrust. 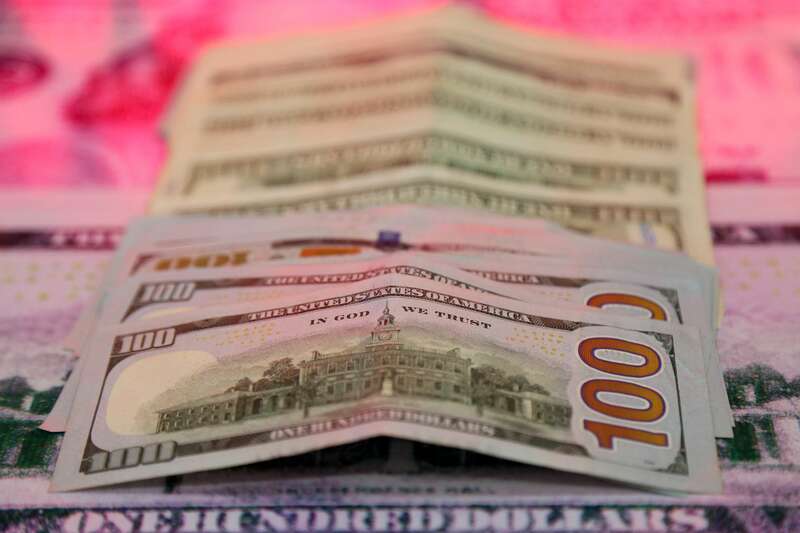 The sources said in a statement to Reuters that the option to abandon the dollar has been discussed internally by a number of senior Saudi officials in the field of energy in recent months. Two sources said the plan was discussed with OPEC members. A source familiar with Saudi oil policy said Riyadh also conveyed the threat to senior US energy officials. The prospect of the US draft law known as the NOPEC comes into effect, and Saudi Arabia is unlikely to go ahead with its threat, but the mere fact that Riyadh is considering such a move is a sign of Saudi Arabia's alarm over potential US legal threats to OPEC. (Reuters) - Saudi Arabia's rapprochement with Iraq will preserve the stability of the region and the world, the chairman of the Saudi-American Relations Committee (SABRAK), Salman al-Ansari, said. Al-Ansari said on Friday that "the rapprochement between the two countries is clear strategic dimensions since 22 October 2017, when they signed in the Saudi capital Riyadh an agreement to launch the Joint Coordination Council, the first of its kind, in the presence of former US Secretary of State Rex Tillerson." 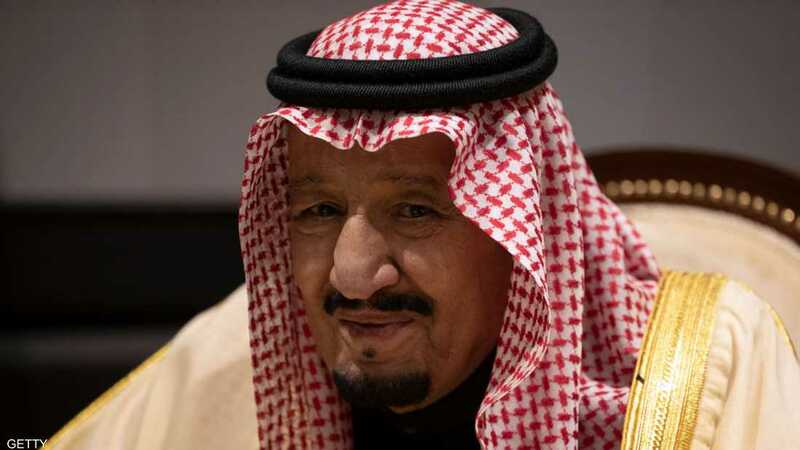 He added that "the Kingdom has taken practical steps to strengthen and revitalize these relations, which have been frozen for the past three decades, which appeared in the opening of the port Arar border in August 2017, and restart the air navigation line between Riyadh and Baghdad in October 2017 after a stop since 1990. Al-Ansari pointed out that "what indicates the strengthening of the relationship is what the Kingdom announced at the Iraq Reconstruction Conference hosted by Kuwait in February 2018, the allocation of $ 1.5 billion for projects that contribute to the reconstruction of Iraq, which was destroyed by war and sectarian and sectarian rupture." He continued: "The strategic partnership between the two countries is necessary to confront the common enemies who tried to employ the interruption of relations between Iraq and its Arab region, to spread sectarianism and sectarianism and the use of the Iraqi street to be duped in the back of his Arab brother, and therefore any Saudi-Iraqi rapprochement is in fact a step in the context of maintaining security Regional and global stability "
The Ministry of Electricity, Friday, the signing of a minutes meeting with the Saudi side, in preparation for the conclusion of a memorandum of understanding for cooperation in the field of electric energy between the two countries. "The Minister of Electricity, Loay Khatib, concluded a meeting in Baghdad yesterday with the Saudi Minister of Energy, Industry and Mineral Resources, Khalid bin Abdul Aziz Al-Faleh, for joint cooperation in the field of electrical energy," the ministry said in a statement received by Mawazine News. Between the two countries, in preparation for the conclusion of a memorandum of understanding in the Kingdom of Saudi Arabia during the coming period. " The statement added that "the Iraqi and Saudi delegations met under the chairmanship of the Ministers of the two countries, and the minutes of the meeting were concluded." 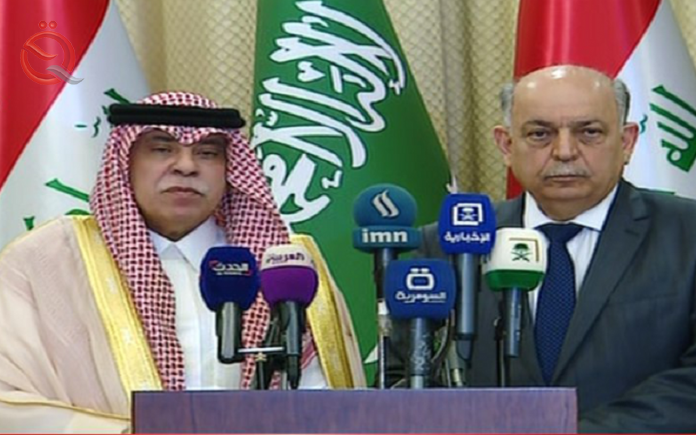 The two sides stressed that "this agreement is a contribution to the achievement of the objectives of establishing the Iraqi-Saudi Coordination Council, and the conviction of the two sides of the advantages of bilateral and technical cooperation in the field of electric energy and enhancing the bonds of friendship between the two countries." The report pointed out that "many of the paragraphs that will be included in the memorandum of understanding, foremost of which are the electric connection between the two countries, the development of the energy market, and urged Saudi factories and companies working in the field of electric power to cooperate with the Iraqi side to cover the demand of electrical equipment and products, Investment and participation in financing the generation, transmission and distribution of electrical energy (renewable and traditional) in Iraq, as well as cooperation in the field of research and studies related to the electricity industry, and the exchange of information, data and studies on upgrading the efficiency of the use of electrical energy E, and therationalization of consumption, as well as the development of human resources through training and exchange of experiences. " A high-ranking Saudi economic delegation comprising seven ministers and dozens of representatives of ministries, government agencies and private companies arrived in the capital Baghdad on Wednesday evening for a two-day official visit to Iraq. announced that the Parliamentary Committee on Foreign Relations, said Friday that all agreements and treaties that have been signed with the Saudi delegation will be subject to discussions in the parliament, as well as hosted the stakeholders, stressing the need to serve the interests of the formulas out of Iraq and its people. Committee member Furat al-Tamimi said in an interview for Alsumaria News that "there is follow-up to the decisions and agreements that took place between Iraq and Saudi Arabia," noting that "some of them are technical and others need legislation." "The opening of the border crossings and the free zone are important matters, in addition to opening the Saudi consulate and the benefits it will gain in facilitating the issue of obtaining visas and visa for the Hajj and Umrah season," he said, adding that "Iraq needs all these things, . 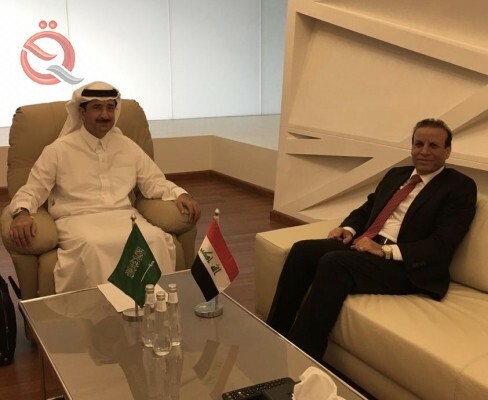 "The Saudi delegation's visit and its results are the beginning of the development of relations between the two countries," Al-Tamimi said, adding that he hoped that the developments would be fully exploited. Al-Tamimi pointed out that "any agreements or treaties that are concluded must be presented within the parliament, as stipulated in the Constitution for discussion and study within the parliamentary committees, detailed in detail, and to come up with a formula that serves Iraq and its people." Al-Tamimi stressed that "what is produced by the agreements with Saudi Arabia or other countries should be the interest of Iraq is above all, and all agreements will be subject to parliamentary legislation to the discussions and additions to personalities concerned with economic and commercial affairs, both ministries concerned or outside." 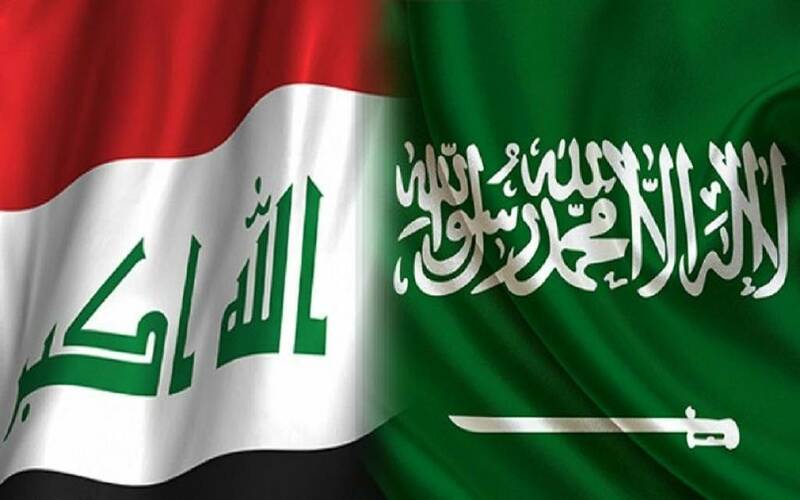 The Saudi consulate in Iraq was inaugurated in Baghdad on Thursday with the presence of Iraqi Foreign Minister Mohammed Ali al-Hakim and the head of the Saudi delegation to Iraq, Minister of Trade and Investment Majid al-Kasabi. The delegation was attended by nine ministers and dozens of officials and businessmen. The Saudi consulate in Baghdad, one of four consulates scheduled to open in Iraqi provinces, after decades of interruption of diplomatic relations between Riyadh and Baghdad. The Saudi investment minister, Majid bin Abdullah al-Kasabi, revealed on Thursday that Iraq gave the Saudi investors 186 investment opportunities, indicating that the idea was proposed for the establishment of a free zone on the border port, as well as an agreement on the electric connection with Iraq. The head of the legal committee in the Iraqi parliament, Sheikh Ali, called on donor countries to Iraq after providing funds to governments in this country. 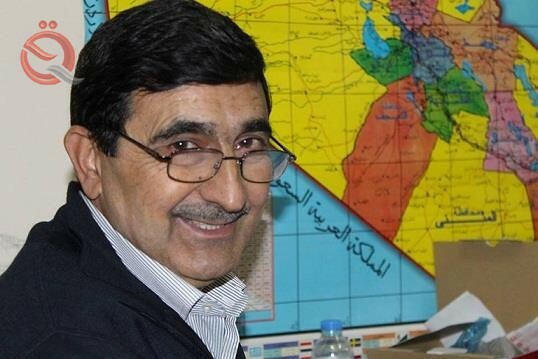 "As a deputy on behalf of the Iraqi people, I address the donor countries (especially the Gulf countries): Do not hand over our governments dinars, dirhams or riyal, because they will go to groups of thieves and hampers," Sheikh Taghreh wrote on his Twitter account. "If you give the government money, I'll spit on you," he said. On Thursday, Saudi Arabia opened its consulate headquarters inside the Green Zone in the center of the Iraqi capital Baghdad, with three more consulates opening soon in a number of Iraqi provinces. Saudi Arabia has announced a financial grant to Iraq worth one billion dollars to contribute to its development. The Kingdom will be a key partner in the renaissance of Iraq and a sports city will be a gift from King Salman bin Abdulaziz to the Iraqi people. The relations between Baghdad and Riyadh have improved significantly in recent times. The two sides agreed in October to open border ports and develop ports, roads and border areas and increase economic cooperation. 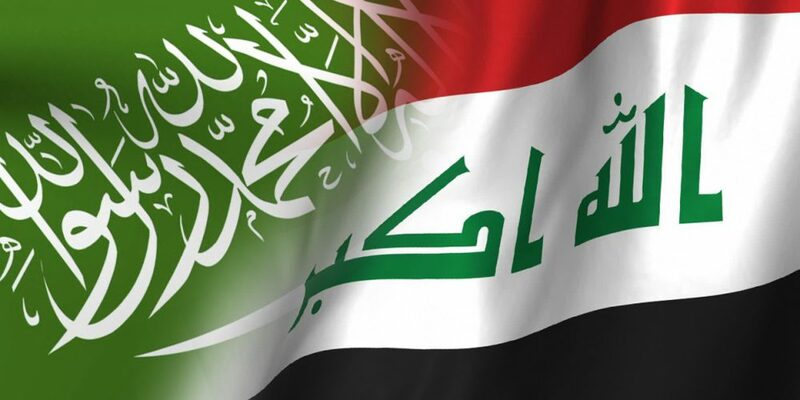 A large Saudi delegation is visiting Baghdad, to sign a number of agreements between the two parties within the work of the Iraqi-Saudi Coordination Council. The rapprochement between Saudi Arabia and Iraq dates back to 2015 when Saudi Arabia reopened its embassy in Baghdad, which has been closed for 25 years. Saudi Ambassador to Iraq Abdulaziz Al-Shammari confirmed that Iraq has approved a draft memorandum of understanding to protect Saudi investments inside Iraq. "There will be fruitful cooperation between Riyadh and Baghdad, where the Iraqi Prime Minister issued a draft memorandum of understanding on the protection of investments between the Kingdom of Saudi Arabia and the Republic of Iraq, and this is very encouraging for investment," Al-Shammari said in an interview with the Saudi daily Al-Youm. "He said. He added that the Saudi product is one of the best products and desirable in the Republic of Iraq because of its high quality and competition for many products of other countries, and is one of the best products at all levels except food products or construction materials. Al-Shammari pointed out that Iraq is coming in the next phase on the reconstruction and development, and the Saudi companies will have an active role there. The Kingdom will contribute 1.5 billion as a contribution to the reconstruction of Iraq. Development projects will be allocated to benefit the Iraqi citizen. For the Kingdom and Iraq will be an important stage in the relations between the two countries. Majid al-Qasabi, the Saudi minister of trade and investment, said that the Kingdom will host Iraqi Prime Minister Adel Abdul-Mahdi in less than 3 weeks. He pointed out that 13 agreements will be signed in the fields of energy, environment and a number of other fields. Salman opened four consulates in Iraq, started in Baghdad and then the role will come on Najaf and Basra. "The technical teams are studying the needs and requirements of the link to enable Iraq to meet its needs of electricity, water and petroleum materials," he added. He added: "We will facilitate the travel procedures between the two countries, and after the opening of the Saudi consulate in Baghdad, Iraqi citizens can obtain a Saudi visa directly instead of going to Amman." The activities of the Forum of investment and reconstruction of Iraq, Saudi Arabia, on Wednesday and Thursday, in Fadak al-Rashid in central Baghdad. 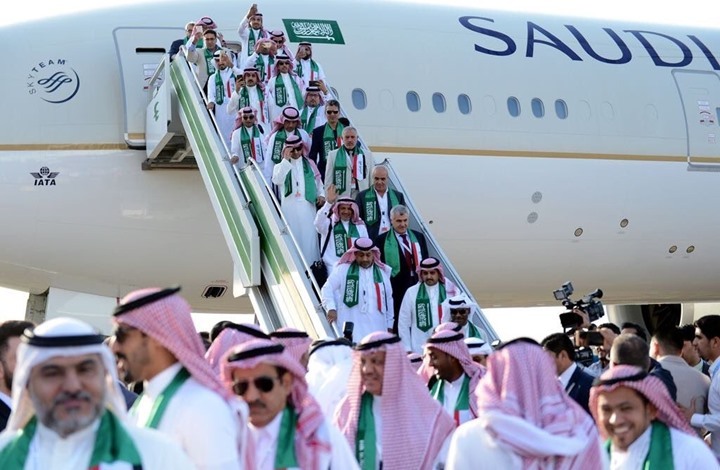 A delegation from Saudi Arabia, which included a large number of ministers, businessmen and owners of major Saudi companies, arrived in Baghdad on Wednesday. The delegation was received at the Baghdad International Airport by the Chairman of the Saudi-Saudi Coordination Council, Deputy Prime Minister for Energy, Oil Minister Thamer Ghadhban, and a number of ministers, officials and heads of economic organizations and unions. The Saudi delegation, headed by the Minister of Trade and Investment, Majid Abdullah Al-Qasabi, Prince Badr bin Abdullah bin Mohammed, Minister of Culture, in addition to a number of ministers, officials and businessmen from the private sector. The Iraqi Economic Council said in a statement received by Mawazine News that "among the activities of the Iraqi Saudi Forum, held a meeting of investment and reconstruction of Saudi Arabia, which was held at 7 pm at the Rashid Hotel, attended by a number of representatives of the Iraqi government and a number of businessmen President of the Iraqi Economic Council, Ali Sabeeh, Chairman of the Federation of Iraqi Industries, Ali Sanafi, Chairman of the Federation of Contractors, Hassan Al-Tamimi, Chairman of the Iraqi Federation of Industries, Mr. Ali Al-Tamimi,Federation of peasant associations, Abdul Razak Zuhairi President of the Federation of Chambers of Commerce. Chairman of the Baghdad Chamber of Commerce, Damer Zaidan Mukhlaf, Chairman of the Salahuddin Chamber of Commerce, Aqeel Jumaili, Member of the Iraqi Economic Council, Ghadir Al-Attar Member of the Iraqi Economic Council, member of the Iraqi Economic Council, Taha Mohammed Wajer, member of the Iraqi Economic Council, Thamer Abdullah Dhari, member of the Iraqi Economic Council, Ali Tabar A member of the Iraqi Economic Council, Abdulrahman al-Mashhadani, adviser to the Iraqi Economic Council, in addition to a number of heads of various economic organizations and a number of Iraqi businessmen and women owners of companies in the industrial, agricultural, commercial, energy, banking and investment. At the opening of the forum, Adel Al Masoudi, Director General of International Relations at the Ministry of Commerce, delivered a speech welcoming the guests. He pointed out "the importance of developing economic relations and increasing the volume of trade exchange between the two brotherly countries and ways of enhancing bilateral relations to the level of ambition of the Iraqi and Saudi sides. Private sector in the process of economic development ". Masoudi stressed "the diversity of cooperation between the two countries, both in terms of contributing to investment opportunities or in terms of the rehabilitation and development of existing projects and new projects," expressing his "hope that these projects will receive the attention of the private sector of Saudi Arabia." For his part, the Executive Chairman of the Group of autumn companies Saudi Arabia, Mohammed bin Abdullah Al-Kharayef, a speech in which he expressed his "sincere thanks to the Prime Minister in Iraq to encourage them and keen interest in trade and investment exchange between the two countries," noting that " Specialized consultancy to discuss investment in Iraq, which came out with recommendations that would work to remove obstacles that may face Saudi and Iraqi investors have raised these recommendations to the Saudi-Iraqi Coordination Council. " He added: "We look forward to the implementation of recommendations and results are feasible on the ground," expressing his "hope that the meetings continue with the Iraqi side to achieve economic vision in the two countries." , the president of the Iraqi Economic Council, Ibrahim al-Masoudi (Baghdadi), gave a welcoming speech to the Saudi brothers The participants in the forum, noting that "the Iraqi side is looking to achieve partnerships and not trade (interface)"
He stressed Al-Masoudi, "the existence of many opportunities and many in Iraq for investment," pointing to "the activation of several laws were disabled and stands a barrier to move the wheel of the Iraqi economy" . He called on the Saudi side to "establish partnerships between the two sides to enter medium projects for investment opportunities, as well as to establish joint agricultural and industrial projects and to establish joint industrial cities on the border with the two countries." The head of the Iraqi Economic Council, "the need for harmony in the work of economic institutions and promote joint cooperation to reach the stage of economic integration." The Prime Minister's Advisor, Laith Kubba, delivered a speech welcoming the guests, stressing that "Iraq has overcome the challenges it has faced over the last period and the fundamental transformation of a central state that controls the economy and makes it fully into a modern state that has overcome the challenges due to the constitutional changes it has undergone." "Iraq is full of real opportunities in all its sectors and extends its hand to its neighbors and brothers in the Gulf region, especially Saudi Arabia, and Iraq looks forward to opening real bridges with the Saudi brothers," Kubba said. Masdar's Managing Director and Chief Executive Raed bin Ibrahim Al-Mudeih delivered a speech in which he stressed the Kingdom's keenness to build bridges and open the border port between the two countries. It is expected to be completed in October of this year, which will facilitate trade and investment between the two countries. "He said. "We conducted a study in the business center and the result was that 94% of the businessmen showed their willingness to invest in Iraq," he said. 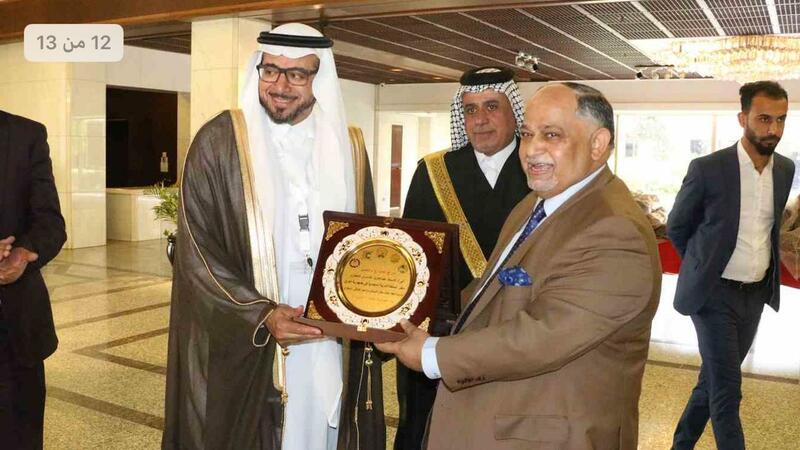 Prince Abdulaziz bin Faisal bin Abdul Majeed Al Saud, Chairman of the Board of Directors of Future Solutions, thanked Iraqi government officials and businessmen for their "generosity and long-standing relationship." The future solutions company focuses on the scope of public transport and attention to electric power. At the end of the forum, the Iraqi and Saudi delegations started to introduce themselves and hold side-by-side consultations aimed at strengthening the frameworks and pillars of economic and investment cooperation between the two countries. The Saudi Oil Company (Aramco) has expressed its willingness to invest in Iraq in a number of projects, including the Petrochemistry project in cooperation with Shell. "This project is one of the giant projects that the Ministry of Oil has worked with in collaboration with the Ministry of Industry and Shell and therefore Aramco will be involved in this project," ministry spokesman Assem Jihad said in a statement quoted by Al-Mada newspaper. "There are subcommittees Will study these projects before implementation. " He added that "the large Saudi company will enter into the investment of burned gas in addition to entering the process of oil exploration and development and training as well as coordination in international conferences, especially OPEC," pointing out that "SABIC Saudi Arabia, one of the world's most prestigious companies also expressed willingness to enter the field Minerals and in the development of iron and steel project in the province of Basra and phosphate in Anbar. " He stressed that "the number of fields to be operated by the Saudi Aramco company is currently subject to study before the conclusion in the form of agreements and memorandums of understanding to mention the names of projects and the size of investment in the oil sector," stressing that "there is a desire to accelerate the resolution and implementation of these projects by the parties." As for the power aspect, the spokesman of the Ministry of Oil that "there is a Saudi desire to improve the reality of electric power through investment and take advantage of alternative energies such as solar energy." 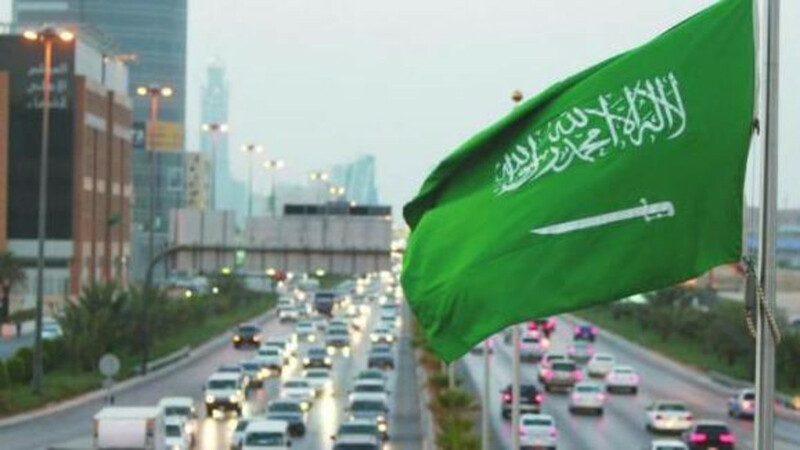 The spokesman of the Ministry of Oil that "the sub-committees began to study this subject for completion before the visit of the Prime Minister to Saudi Arabia, which will be on 17 of this month to sign it," pointing out that "this study will determine the distance and energy through the sub-committees between the parties "He said. Jihad revealed that "there is an agreement to encourage Saudi investment in this framework through the construction of power stations within the territory of Iraq to increase energy," stressing that "these agreements relating to energy is a preliminary note is still under study." The Iraqi-Saudi Coordination Council meeting reached a number of security, trade, economic, banking, investment and tourism agreements and treaties. Saudi Arabia has submitted a list of 891 products for the purpose of reducing or exempting them from customs duties, in addition to a proposal to open a free zone in the Arar port after opening in the next six months. The meetings included the development of financial relations, urging Saudi banks to open branches in Iraq, in addition to opening a branch of the Iraqi Trade Bank in Riyadh in the middle of next month, as well as study the export of Iraqi dates and wheat and other national products and achieve integration in food security between the two countries and investment in poultry And agrarian reform. The concerned ministries have concluded agreements to invest the Kingdom's expertise in the fields of engineering, science and quality in the fields of engineering, science and quality, and to sponsor and discover talented people, as well as organizing reciprocal visits to students and increasing scholarships according to the competencies of energy, science and other important disciplines. In the field of investments, committees of the Iraqi-Saudi Coordination Council have agreed to open the door to investment in the oil and gas, industry, electricity, manufacturing, and the production of electric and renewable energy, as well as investment in phosphate and petrochemicals. The most important decisions of the Council came in agreement to develop a plan for the project of rail links between the two countries and exchange studies on the development of ports and air transport. The council discussed mechanisms to start implementing the stadium project to Iraq in the coming months. In the tourism sector and religious visits, the parties concerned with Hajj and Umrah and religious visits in Iraqi cities have confirmed the rehabilitation of the old pilgrimage route between Kufa and the Holy Land, increasing the share of Iraqis wishing to perform the annual pilgrimage, in addition to opening the horizons for tourist groups, On antiquities, manuscripts and museums. Saudi Arabia provided to Iraq, on the sidelines of the Iraqi Saudi Coordination Council meeting, the list included 891 items of products for the purpose of reducing or exempt from customs duties. In addition to the list of exemptions of customs, Saudi Arabia submitted a proposal to open a free zone in the port of Arar after opening in the next six months. The meeting discussed the development of financial relations and urged Saudi banks to open branches in Iraq, in addition to opening a branch of the Iraqi Trade Bank in Riyadh in the middle of next month, as well as study the export of Iraqi dates, wheat and other national products and achieve integration in food security between the two countries and investment in poultry And agrarian reform. The most important decisions of the Council came in agreement to develop a plan for the railway project between the two countries and exchange studies on the development of ports and air transport. denied the Saudi Energy Minister Khaled al - Faleh, on Monday, reports of threat to Saudi Arabia to sell oil in currencies other than the dollar. "Of course not, no change to our long-standing policy of oil trading in US dollars," Al-Falih said at an energy conference in Riyadh, commenting on Saudi Arabia's abandonment of the dollar. Earlier, the Reuters news agency reported in a report that "Saudi Arabia threatens to sell its oil in currencies other than the dollar, if Washington enacted a law that puts OPEC members under the jurisdiction of antitrust cases in the United States." On the other hand, the Saudi minister revealed that the demand for the first international bonds from Aramco is expected to exceed 30 billion dollars. He said the Aramco bond deal would close on Wednesday. He expressed hope that Aramco's acquisition of Saudi Basic Industries Corporation (SABIC) would be completed within six months. Saudi Aramco is preparing to launch a major bond offering, in cooperation with international banks, including JPMorgan Chase. Early indications are investors are excited about the deal, which is expected to see a bond offering at least $ 10 billion this week. [size=13][size=13]Just a day after the Saudis allegedly threatened the hegemon of the almighty petrodollar, Saudi Aramco began the sale of its first-ever dollar bonds with an order-book of around $40 billion. As we reported last week, Entering the bond market forced Aramco to open its books after decades of speculation about its earnings and production. The Aramco prospectus revealed massive profits which beat out tech giants like Apple and publicly-traded rivals in the energy space like Exxon-Mobil and Royal Dutch Shell, establishing the energy behemoth as by far the world's most profitable company. In 2018 alone, Aramco's profits exceeded $110 billion on $360 billion in revenue. That's nearly double Apple's $60 billion profit, and five times Shell's ($23.9 billion). Thanks to the surge in oil prices last year, Aramco's net income climbed by 50% from $75.9 billion in 2017. As Bloomberg notes, the success of the sale is hugely important for banks, such as JPMorgan and Morgan Stanley, that are working on the company’s behalf. They are also eager to run an initial public offering by Aramco - the world’s most profitablecompany - if and when it comes, which would bring lucrative fees for the selected banks. Citigroup, Goldman Sachs, HSBC and NCB Capital are also managing the bond sale. With demand for the bonds clearly skyhigh, some investors remain torn on whether that interest will allow Aramco to pay yields lower than what its owner does, the Saudi Arabia government. On the one hand, Aramco is immensely profitable and produces endless cash flow. In addition, investors who manage high-grade corporate debt are showing interest in buying the Aramco bonds. All of that could bring the borrowing cost lower than that of the government, according to Nikolay Menteshashvili, an analyst with Insight Investment in London. The Foreign Relations Committee on Thursday confirmed the government's intention to open a new page with the Arab countries, indicating that Prime Minister Adel Abdul Mahdi's visit to some Gulf countries will witness the signing of strategic agreements. "Iraq is going to resolve crises with its Arab environment and opening up to the Gulf states in the coming days," committee member Amer al-Fayez told the news agency. He added that "Prime Minister Adel Abdul Mahdi's upcoming visit to Saudi Arabia and Gulf countries will witness the signing of strategic agreements in the field of investment and security cooperation and economic." 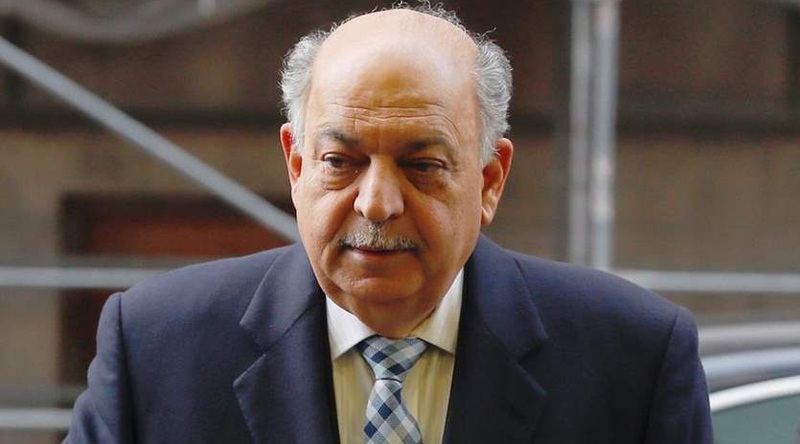 The Iraqi ambassador to Saudi Arabia, Qahtan Taha Khalaf, revealed last Tuesday about the expected visit of the Iraqi Prime Minister, Adel Abdul Mahdi, to the Kingdom after about two weeks, to sign 13 agreements. The Fatah Alliance revealed, Thursday, the discussion of a file on Saudi Arabia meeting building alliance held yesterday. "The most important things that were discussed at the construction meeting yesterday are the visits made by the delegations of the Arab countries to Iraq, in addition to the visit of the presidents of the Republic Barham Saleh and the ministers Adel Abdul Mahdi to neighboring countries. " He added," these visits have a role to strengthen relations between Iraq and other countries and open new economic prospects , "adding that" the visit of the Saudi delegation and the agreements between him and Iraq is incorrect step, the government should not forget what Zbpth Saudi Arabia the Iraqi people. " he pointed Silverline, that" Saudi Arabia was to provide compensation for Wei martyrs, in addition to helping Iraq in the rehabilitation of infrastructure. " 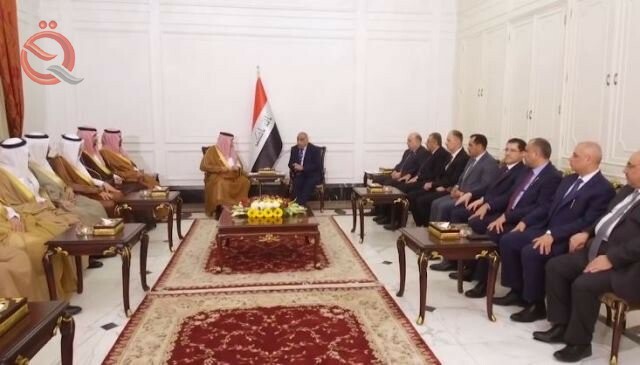 This held the political body of the alliance building, on Wednesday, a meeting attended by key cabinet Adel Abdul Mahdi and parliament Mohammed Halbusi and the leader of a coalition of state law , Nuri al - Maliki and the president of the Alliance of Conquest Hadi al - Amiri. 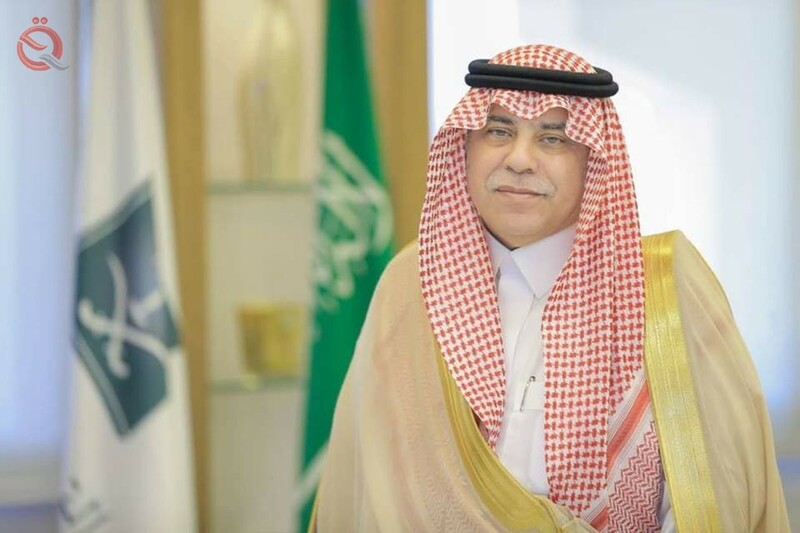 Announced the Saudi Minister of Trade and Investment, Majid Bin Abdullah Al - cane, which The meeting of the Saudi-Saudi Coordination Council, which was held in Baghdad on Thursday, April 4, 2019, was attended by a senior Saudi delegation headed by Prime Minister Adel Abdul Mahdi. Iraq and Saudi Arabia discussed Saturday the readiness of the memorandum of understanding between the Iraqi Ministries of Industry, Energy and Mineral Resources, which will be signed during the visit of Prime Minister Adel Abdul Mahdi to Saudi Arabia soon. "The Iraqi ambassador to Riyadh, Qahtan Taha Khalaf, met with Deputy Minister of Energy, Industry and Mineral Resources for Industry Affairs Abdulaziz bin Abdullah Al-Abdulkarim at his office in the ministry's office," said a statement by the Foreign Ministry. During the meeting, the two sides discussed opportunities for cooperation in the industrial field and investment opportunities for industrial projects in Iraq through major Saudi companies. The memorandum of understanding between the Iraqi Ministry of Industry and the Saudi Ministry of Energy and Mineral Resources has also been discussed and will be signed within the framework of the Coordination Council Iraqi - Saudi during the visit of Prime Minister Adel Abdul Mahdi to Saudi Arabia soon. 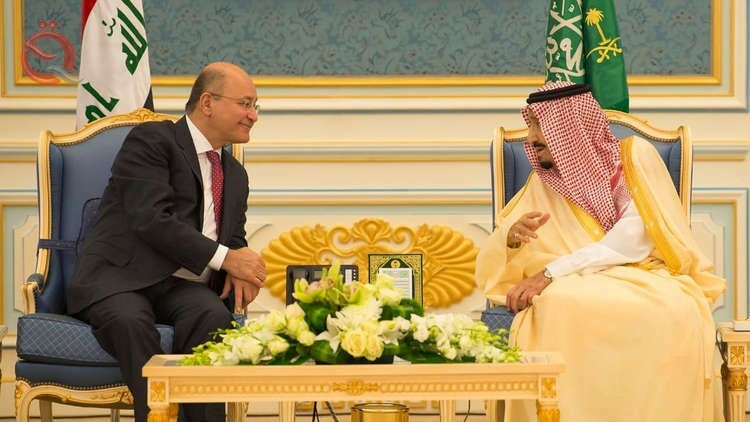 A political source revealed on Tuesday a visit by Prime Minister Adel Abdul Mahdi to the Saudi capital Riyadh on Wednesday. The source said, according to "RT", that "Abdul-Mahdi heading to the Saudi capital Riyadh on an official visit." He added that "a number of ministers will accompany Abdul Mahdi to Riyadh, most notably the ministers of foreign affairs, oil, electricity and trade," noting that "Abdul Mahdi will meet Saudi King Salman bin Abdul Aziz." The source pointed out that "other meetings are now arranged, most notably with the Saudi Crown Prince Mohammed bin Salman," noting that "the Saudis did not find the seriousness of the Iraqi government to implement the agreements because of pressure exerted on the Iraqi government, so he wants to assure them that the agreements will go In its proper way "
RIYADH: Iraqi Prime Minister Adel Abdul Mahdi will begin an official visit to Saudi Arabia on Wednesday. Abdul Mahdi heads a high-level delegation of more than 11 ministers, 68 government officials and more than 70 private sector businessmen for a two-day visit, the Commerce Ministry said in a statement on Tuesday . The visit will carry important files to discuss the bilateral relations between the two countries and ways to strengthen them, and developments in regional and international issues of common concern. She explained that the Saudi-Iraqi relations are based on historical, religious and social bases, in addition to the political desire in Riyadh and Baghdad to deepen these relations to be a new start for a new stage between the two brotherly countries . She added that the visit will discuss the prosperity of Iraq and deepening relations of cooperation in all fields, and the desire to see relations further development and coordination and reach agreements that serve the common interests. The visit will include the signing of several agreements and memorandums of understanding, including economic, educational and technical, as well as bilateral meetings, and the convening of an economic forum and meet businessmen from both countries . 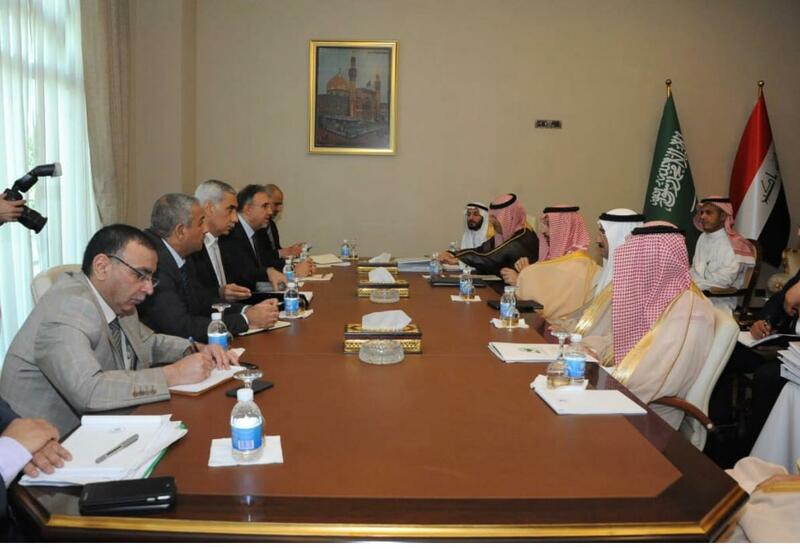 On the sidelines of the visit, the meetings of the Political, Security and Military Committee, chaired by the foreign ministers of the Saudi-Iraqi Coordinating Council, will be held on the basis of the strength of the Saudi-Iraqi relations, which will constitute a cornerstone of relations in the region based on the many interests that bring together their peoples and countries . It is expected that during this visit, the Kingdom will be ready to operate the trade exchange in a new port of Arar starting from the beginning of next June to start trade exchange between the two countries, and the completion of the full port in mid-October with the joint cooperation between the two sides. The visit comes as a result of the work of the Coordinating Council between Saudi Arabia and Iraq, which was established at the direction of the two countries' leadership as one of the main means for the two countries to upgrade relations to the desired strategic level and open new horizons of cooperation in various fields. 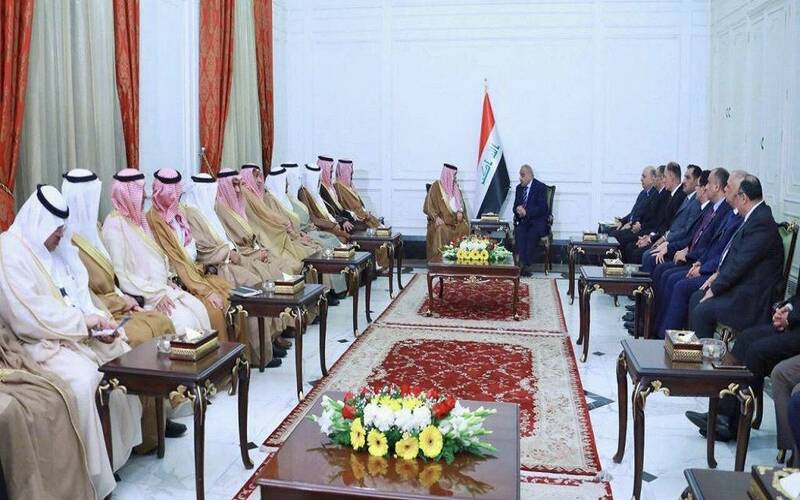 The members of the Saudi-Iraqi Coordination Council are 14 members from the Saudi side from all sides and fields, and are similar to the same number from the Iraqi side . The Council concluded its second session in Baghdad recently. The Minister of Trade and Investment, Majid bin Abdullah Al Qasabi, headed the Saudi side, and the Deputy Prime Minister and Minister of Oil Thamer Ghadhban from the Iraqi side. The Council witnessed the discussions on the 13 agreements and memorandums of understanding in various fields and are working on them in preparation for signing on the sidelines of the Prime Minister's visit to the Kingdom, which will begin tomorrow . The second session included the opening of the Saudi consulate in Baghdad to facilitate the obtaining of commercial visas, and the agreement on the importance of continuing joint work to develop trade exchange and remove any obstacles facing it. In addition to enabling the contribution of the private sector from both sides in the next phase and discuss the formation of the Joint Business Council from the Iraqi side to start the work of the Council and come up with a plan of action that will enable its contribution to achieve the desired objectives . The second session witnessed meetings of the private sector and the readiness of four major Saudi companies to enter the Iraqi market in a number of sectors targeted by Iraq. 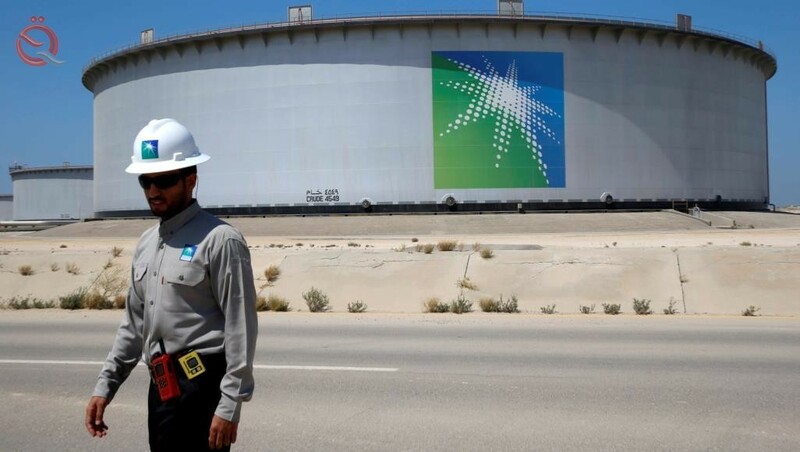 Saudi Aramco to invest in a gas assembly project, SABIC to invest in the construction of petrochemical complex, Ma'aden to invest in phosphate, fertilizers and aluminum, and Aqua Power to invest in a project to connect electricity and renewable energy projects. RIYADH: Saudi officials have agreed with the global company POPULOUS to build the city of King Salman Sports in the Iraqi capital Baghdad, donated by Saudi Arabia to Iraq worth more than 400 million dollars. 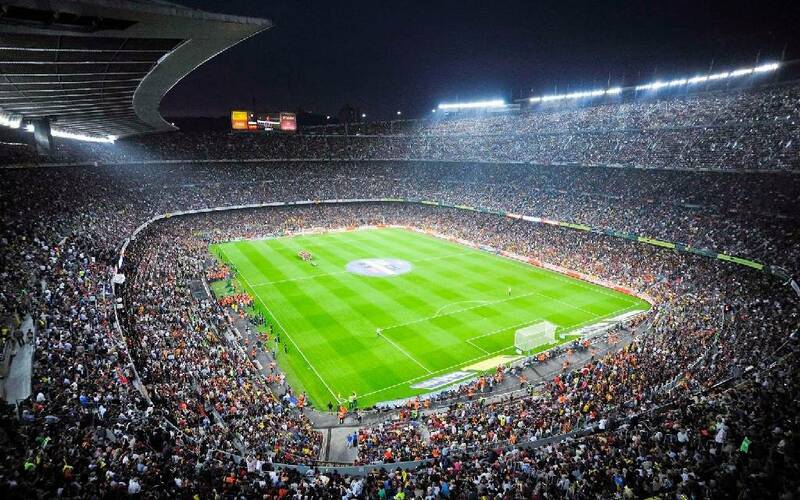 It was agreed that the stadium would be similar to Tottenham Hotspur, with a capacity of 85,000 spectators, with minor differences, according to Mecca. The city will be operational in June. The head of the committee overseeing the city's sports project, Abdul Rahman al-Harkan, was briefed with Iraqi officials on the three sites nominated to host the sports city. A spokesman for the Ministry of Youth and Sports of Iraq, Mowafak Abdul Wahab, February 11, 2019, the Saudi delegation overseeing the establishment of the stadium or sports city dedicated from Saudi Arabia to Iraq , briefed on the proposed sites for his residence in Baghdad. The Saudi Cabinet reviewed the results of the visit of the Kingdom's delegation to Iraq and its meetings with senior officials, the work of the second session of the Saudi-Iraqi Coordinating Council held in Baghdad, and the announcement of the Saudi King's gift of building King Salman City Abdul Aziz Sports "for the children of Iraq. Saudi Arabia's Prime Minister Adel Abdul-Mahdi is due to visit Saudi Arabia on Wednesday, the official SPA news agency reported. The delegation includes more than 11 ministers, 68 government officials and more than 70 private sector businessmen on a two-day visit. The visit will focus on the bilateral relations between the two countries and means of enhancing them, and developments in regional and international issues of common concern. The Saudi-Iraqi relations are based on historical, religious and social bases, in addition to the political desire in Riyadh and Baghdad to deepen these relations. Which establishes strategic relations that serve the interests of the two countries. The visit will discuss the prosperity of Iraq, the deepening of cooperation relations in all fields and the desire for relations to witness further development, coordination and reaching agreements that serve the common interests. The visit will include the signing of several agreements and economic memoranda of understanding, And meet businessmen from both countries. 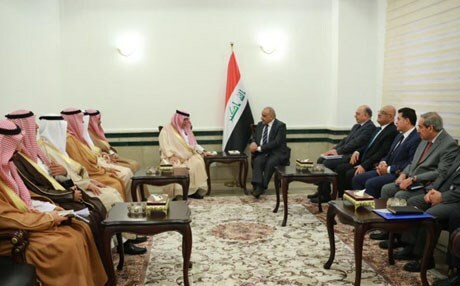 "The meetings of the political, security and military committee headed by the foreign ministers of the Saudi-Iraqi Coordinating Council will be held on the sidelines of the visit, based on the strength of relations between the two countries, which will constitute a cornerstone of relations in the region on the basis of the many interests that are gathered, Peoples and nations ". "This visit comes as a result of the work of the Coordinating Council between Saudi Arabia and the Republic of Iraq, which was established under the guidance of the leadership of the two countries as one of the main means for the two countries to upgrade relations to the desired strategic level and to open new horizons of cooperation in various fields, Security, economic, developmental, commercial, investment, tourism and cultural. The aim of upgrading bilateral relations is to achieve new horizons in all fields. The Coordination Council works within a specific and agreed action plan. " The members of the Saudi-Iraqi Coordinating Council are 14 members from the Saudi side of their Highnesses and Excellencies from all sides and fields, and are similar to the same number from the Iraqi side. The committee also includes eight committees (the Economic, Trade, Investment, Development and Relief Committee, the Committee on Transport, Border Ports and Ports, the Committee on Energy and Manufacturing Industries, the Political, Security and Military Committee, the Agricultural Committee and the Finance and Banking Committee. The Council concluded its second session in Baghdad recently, where HE the Minister of Trade and Investment, Majid bin Abdullah Al Qasabi, the Saudi side, and the Deputy Prime Minister and Minister of Oil Thamer Ghadhban from the Iraqi side discussed the agreements and memorandums of understanding (13) And is working on them in preparation for signing on the sidelines of the visit of the Prime Minister of the Kingdom, which will begin tomorrow. The second session also included the opening of the Saudi consulate in Baghdad to facilitate the obtaining of commercial visas, and the agreement on the importance of continuing joint work to develop trade exchange and remove any obstacles facing it, and exit priorities for the next phase within a specific plan with milestones and indicators that will achieve the desired leadership As well as enabling the contribution of the private sector from both sides to the next stage and discussing the formation of the Joint Business Council from the Iraqi side to start the work of the Council and come up with a plan of action that will enable it to achieve the desired objectives. The second session witnessed private sector meetings and the readiness of four major Saudi companies to enter the Iraqi market in a number of sectors targeted by Iraq: Saudi Aramco to invest in a gas assembly project, SABIC to invest in the construction of a petrochemical complex, Phosphate, fertilizers and aluminum, Aqua Power to invest in a project to connect electricity and renewable energy projects. This is an affirmation of the Kingdom's keenness to expand its relations with its Arab and regional environment and to pursue a policy that focuses on the many participants and broad cooperation opportunities, especially with neighboring countries such as Iraq. It is expected that during this visit, the Kingdom will be ready to operate the Trade Exchange in the "New Arar" port as of the beginning of next June to start trade exchange between the two countries, and the completion of the full port in mid October next cooperation between the two sides. The Cabinet held its regular meeting in Baghdad on Tuesday under the chairmanship of Prime Minister Adil Abd Al-Mahdi. The Cabinet reviewed health services, and approved measures to ensure that a number of hospitals across Iraq do not face short-term cash flow problems and that patient care continues uninterrupted. The Cabinet discussed Iraq regional role and strengthening cooperation with Saudi Arabia across a number of areas. The Cabinet voted to authorise the Prime Minister to approve amendments to the draft investment promotion agreement between Iraq and Saudi Arabia. The Cabinet authorised the Minister of Finance to negotiate and sign a draft agreement between Iraq and Saudi Arabia on the avoidance of double taxation, and to combat tax evasion on income and capital gains. The Cabinet also authorised the Minister of Transport to negotiate and sign a draft maritime cooperation agreement between Iraq and Saudi Arabia. Prime Minister Adil Abd Al-Mahdi begins on Wednesday an official two-day visit to Saudi Arabia at the invitation of HM King Salman bin Abdulaziz Al Saud. The Prime Minister is accompanied by a high-level delegation of senior ministers, officials and Iraqi business leaders. The Prime Minister will hold talks with Saudi leaders and senior officials on regional developments, sign several strategic agreements to boost bilateral cooperation and meet Saudi business leaders and investors. The Prime Minister told a press conference in Baghdad on the eve of his departure for the Saudi capital Riyadh that Iraqi-Saudi relations were entering a new era of close cooperation. During the visit, the Political, Security and Military Committees of the Iraqi-Saudi Coordination Council will meet under the chairmanship of the Iraqi and Saudi foreign ministers to further strengthen security cooperation between the two countries which is vital for the stability and prosperity of the region. The Iraqi-Saudi Coordination Council was established to elevate the historic ties between Iraq and Saudi Arabia, strengthen political, security, economic cooperation between them, and to facilitate investment and boost trade. [ltr]"The prime minister's visit to Saudi Arabia is not a protocol," Masoudi told al-Furat News. "It is the duty of the executive government, which is authorized by the parliament to implement its government program, to regulate foreign relations." "Previous governments were among political, economic and sectarian reasons that did not play a natural role in improving foreign relations," he said. "There are obligations imposed on Iraq under the United Nations charters, including the regulation of foreign relations," Masoudi said. Prime Minister Adel Abdul Mahdi arrived in Riyadh on Wednesday for a two-day visit to Saudi Arabia. The delegation included a number of government officials, MPs, governors, advisors, heads of bodies and businessmen, as well as the Iraqi ambassador to the Kingdom of Saudi Arabia. 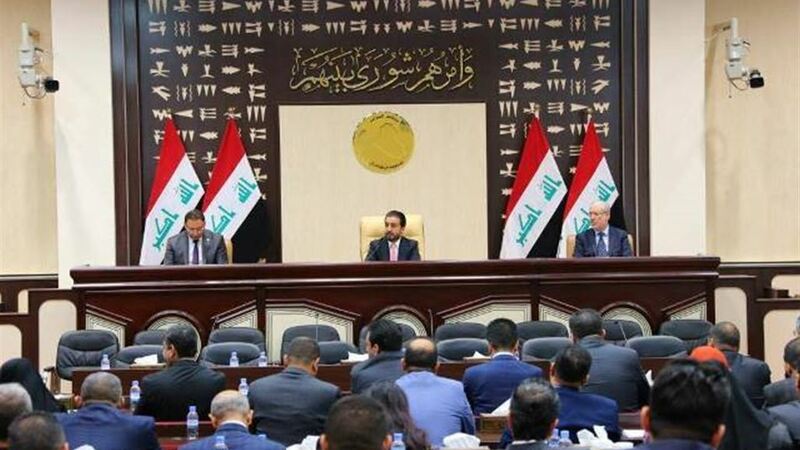 [ltr](Baghdad: Al-Furat News) The Badr parliamentary bloc called on the Iraqi government to solve its internal problems before opening up to the neighboring countries and the region. 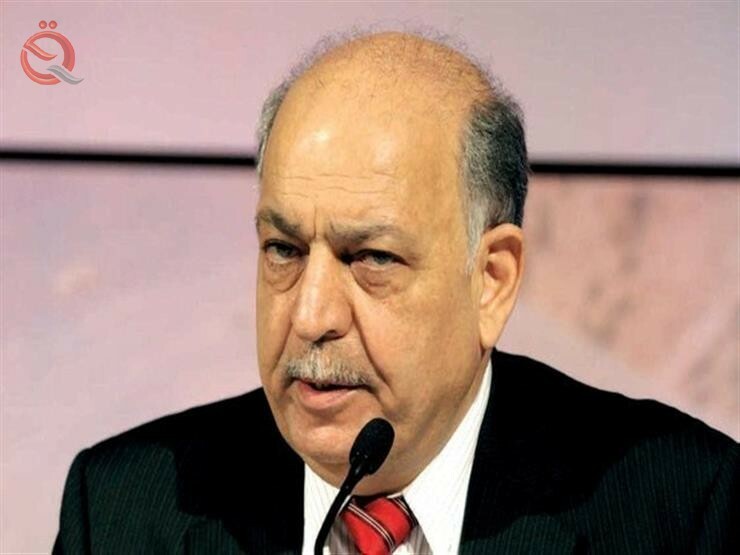 [ltr]"The opening of Iraq to the neighboring countries and the region is required, after it became strong, but must be open to the interest of the country," said the head of the bloc Hassan Shaker (of the Euphrates News). He stressed "the need to resolve the intentions of the Saudi side to Iraq, what it has committed against the Iraqi people," stressing that "be good faith on the ground." "The Iraqi delegation's visit to Iraq is very good, but the exchange of visits and agreements must be in the interest of the Iraqi people," Shaker added. "Iraq is going through a deteriorating service situation and the spread of unemployment and the Iraqi government to solve its internal problems before opening to the outside." [ltr]During the meeting, they reviewed the most important developments in the Kingdom in the field of investment and economic, and ways of cooperation and ways to encourage the private sector in both countries. The Executive Team presented a presentation on "Vision 2030 Kingdom", followed by a brief explanation of the procedures and facilities provided by the Authority to companies wishing to The entry and investment of the Saudi market, the contribution of the promising sectors in the diversification of the economy, and the support of the national transformation program 2020, in coordination with the concerned government agencies. For his part, the Governor of the General Authority for Investment, Chairman of the Economic, Trade and Development Committee of the Saudi-Iraqi Coordinating Council Eng. Ibrahim Al-Omar, praised the visit, which aims to "strengthen the leadership of the two countries towards developing and deepening strategic and economic relations, Interest of both parties, and promote trade exchange between the two countries. " His Royal Highness Prince Mohammed bin Salman bin Abdul Aziz, Crown Prince and Deputy Prime Minister and Minister of Defense, met today with Iraqi Prime Minister Adel Abdul Mahdi, who is currently visiting the Kingdom. The Iraqi Prime Minister shook hands with His Highness the Prime Minister and the members of the Saudi side. During the meeting, they exchanged views on Saudi-Iraqi relations and a number of bilateral issues of mutual interest. Then the Crown Prince and Iraqi Prime Minister held official talks in the presence of the delegations of the two countries. At the beginning of the meeting, His Highness the Crown Prince welcomed the Iraqi Prime Minister in his second country the Kingdom, noting the distinguished relations between the two brotherly countries, while the Iraqi Prime Minister expressed his happiness to visit the Kingdom and meet with the Custodian of the Two Holy Mosques and His Highness the Crown Prince. During the meeting, they reviewed bilateral relations, areas of cooperation between the two brotherly countries and opportunities for their development, as well as the latest developments in the region. The meeting also reviewed the efforts of joint cooperation within the Saudi-Iraqi Coordinating Council and discussed more promising opportunities to serve the interests of both countries and peoples. The meeting was also attended by Minister of Oil Thamer Al Ghadhban, Minister of Finance Dr. Fuad Mohammed Hussein, Foreign Minister Mohammad Ali Al Hakim, Minister of Planning Dr. Nouri Sabah Al Dulaimi, Minister of Commerce Dr. Mohammad Hashim Abdul Majid and Minister of Higher Education and Research Minister of Industry and Minerals Dr. Saleh Abdullah Al-Jubouri, HE Minister of Electricity Dr. Loay Hamid Al-Khatib, Minister of Transport Eng. Abdullah Luaibi Al - Maliki. The Minister of Trade and Investment, Dr. Majid bin Abdullah Al Qassabi, met at the King Saud Palace in Riyadh today with the Iraqi Minister of Trade, Mr. Mohammad Hashim Abdul Majid. During the meeting, they discussed issues of mutual interest between the two countries. The meeting was attended by the Governor of the General Authority for Foreign Trade, Mr. Abdulrahman Al-Harbi. The Deputy Minister of Economy and Planning, Faisal bin Fadel Al-Ibrahim, met at the King Saud Palace in Riyadh today with Iraqi Minister of Planning Dr. Nouri Sabah Al-Dulaimi. During the meeting, a number of issues of mutual interest were discussed.